I may start posting these daily or may continue to do this in a group format. It’s hard to tell with the kids and my life right now. A little update on the doggy poisoning situation of yesterday — apparently one of our neighbors lost a small dog yesterday afternoon to the same ham that was thrown into our back yard! I am even more upset now than I was before! Now to try to change the mood and get on with the fun! Remember, you can click on my photos to see them larger. First are our ICADs from June 2nd. 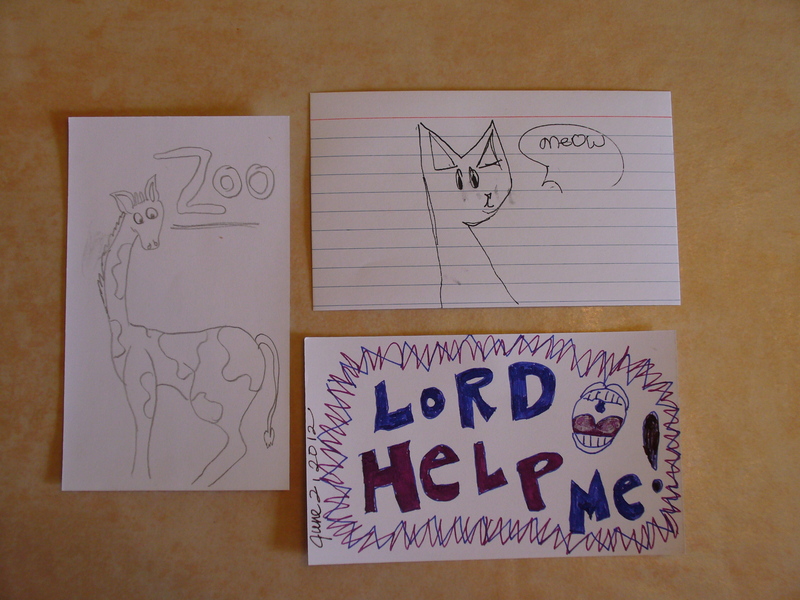 Big C drew the zoo card on the left with a pencil. 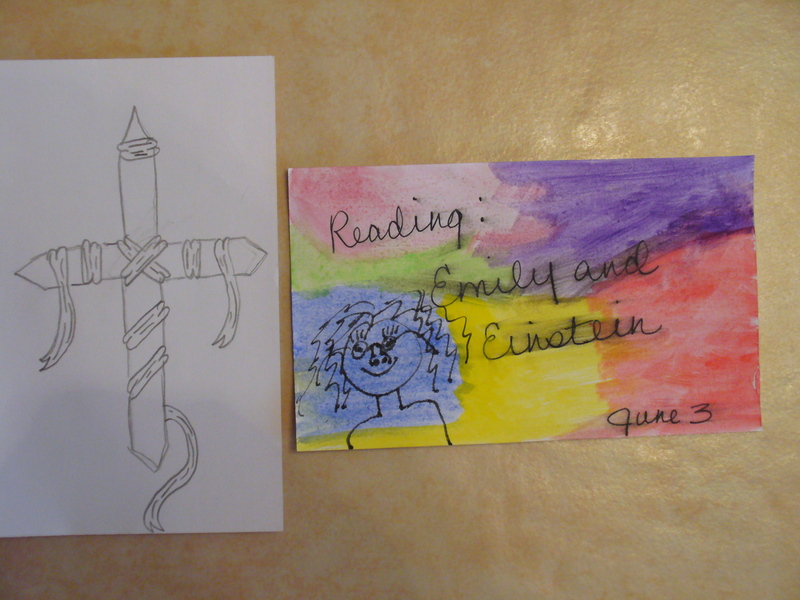 Upper right is a kitty cat drawn by Little C (she used a ballpoint pen) and my card is on the lower right. My card was inspired by a trip to the zoo with a moody pre-teenager and a the fact that my knee hurt like the devil after I slid down a slide and jammed said knee at the landing (note to self — your sliding days may just be over!). My supplies used — fountain pens and white out. Moving on to June 3rd. We have another pencil drawing by Big C and a mess by me. It’s a caricature of me (that just kept getting worse no matter what I added to it) with the book I’m reading at the moment. I added water-color before my fountain pen ink had totally dried, I do believe. Little C did not make a card yesterday. Today, June 4th, we were all in on the act again! Upper left is Big C’s card of smily faces. I laughed out loud when I saw that! 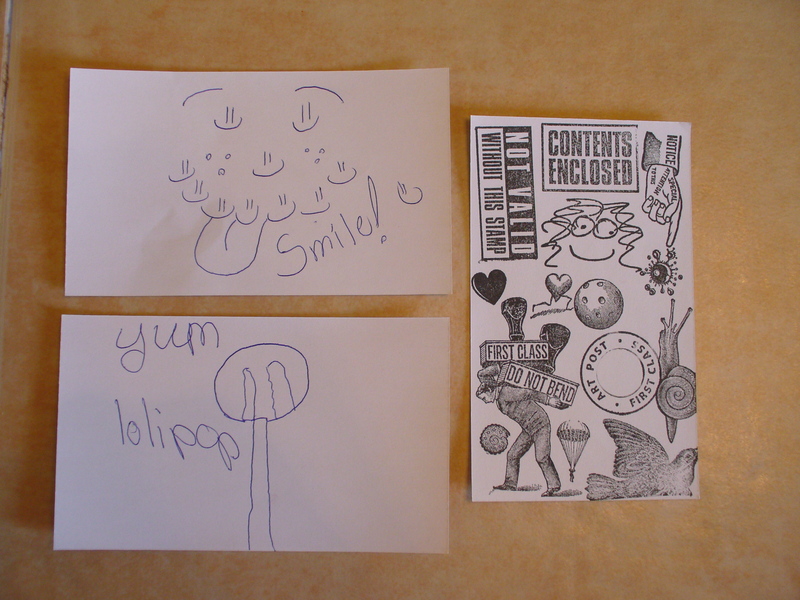 Little C’s card is the lollipop on the lower left (just guess what she was eating at that moment), both rendered in ball point pen. My card is on the right and shows all of the rubber stamps that I brought on this trip. I wanted a quick reference. All of the rubber stamps except for the one directly under “contents enclosed” (which is a custom caricature stamp) are from the same company — Leavenworth Jackson Rubber Stamps . *** It is not too late for you to join in on the fun! Just check out Tammy’s Daisy Yellow blog by clicking here to learn more! See you again soon with some more ICAD posting and hopefully other news of note. Happy trails folks! This entry was posted in book, dogs, family, grandkids, icad, little things. Bookmark the permalink. 10 Responses to ICAD 2,3 and 4! I like how you used the index card to test out all your new rubber stamps. It looks great, and it’s a great reference, too! It will come in handy on this trip, that’s for sure. I think I’ll make more of them for all the ones I have when I get home too. Thank you for stopping by and leaving a comment. Had to laugh at your card that was prompted by the trip to the zoo. Hopefully it all ended well. 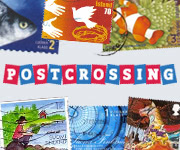 And that one with all the stamps makes me want to go stamp buying, it looks like you’ve got some good ones. Thanks for the link, I’m going to go check them out. The trip to the zoo did end well, but early. We all want to go back. My grandson wanted to go back the next day (because of the places to play in the water)! Her rubber stamps are great! I’ve ordered from Levenworth three times and am planning another order soon. Very nice little company in CA. How sad about the doggy poisoning. Makes me ill knowing someone would do something like that. Thank goodness you were alerted in time. Now on to something much more pleasant: your cards are wonderful! I love seeing all the different styles and inspirations from all of you. Some people in this world are just flat troubled. That’s really my favorite (by far!) that I’ve done. No talent involved at all! I’m loving all the family action with the ICADs. Well done! They are already ditching me!